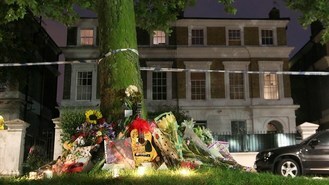 Thousands of mourning fans flocked to the three-bedroom property in Camden and transformed the square where it sits into a shrine following the Back To Black star's death last July. Ten months after the tragedy the singer's relatives have decided to place the house on the market saying it would be inappropriate for any of them to move in. Valued at £2,699,950, the property is listed online as a "substantial and impressive three double bedroom, three reception room semi-detached period villa with well-proportioned private front and rear gardens." It has changed hands once in more than 40 years and had undergone major structural and cosmetic refurbishment, according to online estate network House Network. A number of pictures are included on the advert, including images of the spacious kitchen complete with a black and white chequered floor. The majority of the large rooms have been painted white and have dark wooden floors and ceiling beams. Winehouse was 27 when her body was discovered in a bed at the property after a long battle with drink and drugs.